It’s a lovely sunny day and you’ve been out with your pet pooch and you’re on your way home when you realise you need to pop into the supermarket. But your dog isn’t allowed in the store. What do you do? Do you risk nipping in and leaving the window open for the dog…after all they’ll be fine if you’re quick… Right? Well no, not at all. 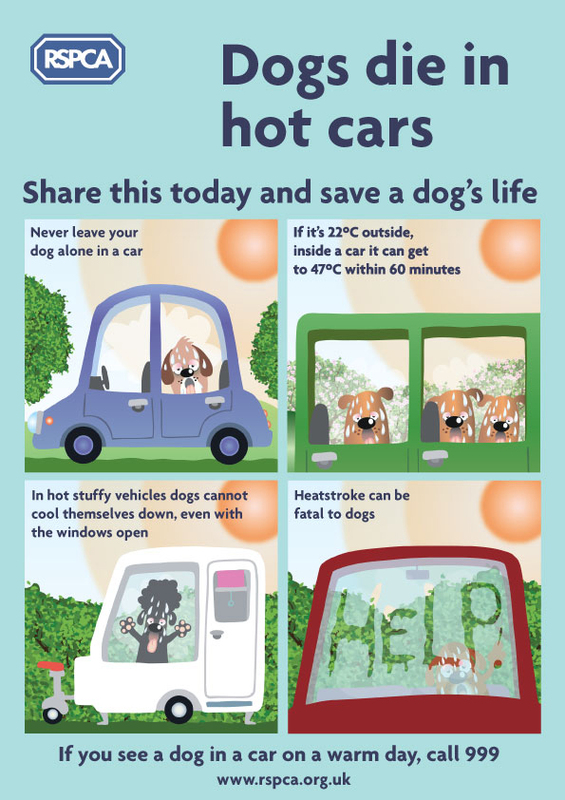 Leaving a dog in a vehicle, particularly on a hot day is extremely dangerous and regretfully often ends up in fatalities. Every year, particularly during the summer months, the media portrays stories of countless unfortunate animals that have perished as a result of their owner’s short-sightedness. A car can become as hot as an oven very quickly, even when it doesn’t feel that warm. When it’s 22 degrees, in a car it can reach a temperature of 47 degrees within 60 minutes. “The glass in cars acts like a greenhouse causing the temperature inside the car to heat up rapidly on warm days and especially if the car is in direct sunlight. These hot temperatures literally cook the brain and delicate tissues of the body, often resulting in seriously ill animals and frequent deaths. If you were to leave your dog in a vehicle and the dog became ill or worse resulted in a fatality, you could well see yourself charged with the offence of animal cruelty under the Animal Welfare Act 2006. If convicted of this offence then you could face up to 6 months in custody and/or a fine of up to £20,000. One solution to the issue has been introduced by an IKEA store in Cologne, Germany. The store has introduced a specific area for customers to leave their dogs whilst shopping in store. The dedicated ‘doggy parking bays’ have artificial grass, water bowls and animals can be secured with their leads to rest in peace whilst their owners browse the store. This latest concept has proved extremely popular with Ikea’s German customers and follows on from the store’s successful ‘Men’s Area’ in Sydney and its popular children’s play areas. Currently this facility has not been made available at any of its British stores but hopefully the concept may catch on.